Notify-Send is sending the timeout to the server correctly as your grep shows, but Notify OSD does not support timeouts. That's deliberate any by design. The timeout-policy for notifications is specified here here https://wiki.ubuntu.com/NotifyOSD#Animations%20and%20durations. Please see https://wiki.ubuntu.com/NotifyOSD#org.freedesktop.Notifications.Notify stating that if the notification-daemon is "notify-osd" values for expire_timeout are ignored. The initial problem is that the API documentation (which I can't find on Google now) and Wiki didn't/don't quite match. It so happened that Adrian and I came across the API documentation, rather than the Wiki. And in most cases I would guess that people using it will just look at the API documentation, especially to find out a parameter they want to use. So to stop future confusion, it's probably worth finding the API page and updating it to be consistent with the Wiki. Then the second discussion, is whether it should be overrideable. If you can't override it, then there shouldn't be a "-t" parameter as it offers no value to those that might try to use it (ie us the Customers), and it only ends up causing confusion. If you want to run a GNOME session, without notify-usd (using the old daemon, notification-daemon) install and use gnome-stracciatella-session. That'll start (selectable from gdm login) a GNOME-session without Ubuntu-specific components. So the developers are making the notification OSD sucky by not disabling something as simple as timeouts on purpose? If I want to send a single on/off message to the screen, I don't need it up there for more than a second or two. Reminds me of the old MS saying: It's not a bug, it's a feature! > we have, it's a bug that should be fixed, not configured around. think anyone has ever complained about it. somewhere ... just provide the option. protocol), and I feel that is a bug. I haven't looked at the code, but I'd guess honouring timeouts would be pretty simple to do. I'm clearly missing something here, because I don't understand at all the point of not doing so, other than "the wiki page says so". Smeuuh, I agree that configuration is not always a sign of doing something wrong. One good use of configurability is to cater for varied hardware or physical abilities; mouse and keyboard sensitivity is in this category. Another is to help people feel that the computer is personally theirs; enb gives background picture as a good example of this category. I don't see, though, that notification bubbles fall into either of those categories. However, all that is really off-topic for this bug report. For example, even if we concluded that a single time setting cannot reasonably cater for the population's variation in reading speed, we would most likely fix that with an overall "Slower <-> Faster" slider, which still would not involve obeying the timeout parameter, which is what this bug report is about. Adrian Roman, please report a bug that the IR remote doesn't trigger the standard volume notifications, if it's not reported already. enb, your subsequent notifications should specify that they are supposed to replace the earlier one if it is still being displayed. Supporting replacement would be a reasonable enhancement request for notify-send. wirespot: volume, brightness, and eject bubbles are instant confirmation (synchronous) of something you have done, whereas notification bubbles are not-necessarily-instant notifications (asynchronous) of something someone else has done. That the two things are presented in almost the same way is a visual design choice (and perhaps they should be displayed more differently than they are). Can you give an example of your "very short piece of text with an explanatory custom icon"? @Matthew Paul Thomas: Here's an example. "Screen saver ON/OFF". Or a more interesting one: "The dog went out/came in." (I'm not kidding, a friend of mine has a sensor on the door flap.) Or "Weekly backup finished." There are lots of oportunity for a knowledgeable Linux desktop user to customize various input triggers (mouse, keyboard, IR remote, proximity sensors, cron job exit status etc.) AND to make the desktop reacts nicely by providing feedback messages. I'm currently using various -osd console tools for this purpose. I was hoping I could use notify-send as a drop in replacement, since it's the hot new thing. But being forced to stare at a message for 5 or 10 seconds, a message consisting of a few short words and an icon? A message I see all the time and I don't even have to actually read anymore, just glance at? Yeah, I know it becomes transparent if you mouse over but that's not the same as going away and not bothering me, is it? Clearly, someone somewhere is thinking that the way *they* use notify-osd is the only possible way anybody could ever use it. Whereas more humble people, like the ones who wrote gnome-osd and didn't presume to dictate me how I should use it, are having me use *their* tool. Because it works and doesn't try to think for me. Hmmm not sure I agree with that explanation. It's clear that people want to be able to set the length a notification shows for. It's a feature that is even listed in the documentation. People are asking to be able to use it, and you're either not letting them, or are suggesting having a one-controls-all slider bar. As far as API's go that's not very usable and you're not catering for people that want to develop for the platform. You still haven't given a clear reason why it's a bad idea to expose the timeout property. There are clear reasons why it would be a good idea to expose it (mentioned above). It benefits the end user's experience, and platform as a whole, as developers are able to write applications with suitable timeouts depending on the context. Hi, thinking that notify-osd is an interesting piece of software, I'm going to write a small program to show messages from my proprietary UPS software to notify-osd. That said, I totally agree with wirespot and other guys here, but I prefer not to comment too much the absurd policy of not considering user needs at all (user needs are indeed important, not categories), which is unheard for developers. So, let's talk about facts. http://www.galago-project.org/specs/notification/0.9/index.html): for sure notify-osd is not DNS compliant. Is that what developers want? After, we can also discuss about changing the default notify-osd timeout when showing notifications with the Expiration Timeout field set to -1. - because the application sending the message is the only one entity that could/should know about message meaning and, for this reason, its caratteristics. I think that notify-osd should mainly care about message exposure/relaying, not about changing timeouts. - because you might force application developers to call the org.freedesktop.Notifications.CloseNotification message command after a desidered time, which would be a bad habit. After all, why would you ignore a timeout setting that is there for a reason (while still cannot see a good reason for ignoring it)? Moreover I think that some notify-osd configuration options, such as placement and default timeout settings, can be useful as well. That would be a kickass application, a real centralized, good looking notifier. I'm using fluxbox and wanted to replace osdctl with notify-send but it won't work if "Workspace 1" message lasts more than a one seconds... changing workspaces needs smaller timeouts. Any workaround? Ugh. When testing my application on Karmic, notification timeouts aren't working as *required* for my application to function. As follow up confirmation, switching to notification-daemon and removing notify-osd works fine. I totally agree with [wirespot] and IMO the notify-osd is totally broken by design. I exclusively use Ubuntu both at home and at work and use the notification subsystem to automate my life. I like to get notified about results of software build and tests; when the backup is done; getting notified about special emails in a different way (duration, icon). tail on a log file, grepping and piping to the notify-send to create flexible notifications is very important to me. The new notify-osd is trying to steel my time. If for example I get three similar notifications in 300ms cycle and wanted them to be shown for about 2 seconds and displayed one on top of each other (can do with notification-daemon), notify-osd shows them for 3 x 5 sec = 15 sec - an eternity for me and the overview is lost (notifications not shown at once). But my worry is, will the nofification-daemon still work in the Ubuntu versions after the Karmic? I would prefer the notify-osd being fixed. wirespot, the variable durations are not implemented yet. Once they are, you'll find that "Screen saver ON" will display for 5 seconds rather than the current 10, which should be much less annoying. Adrian Roman, this has little if anything to do with "users' freedom to alter the environment", because the timeout parameter is for application developers, not end users. We think we can set more consistent and reliable durations for users automatically than diverse application developers ever could manually. Calculating the appropriate duration will be *more work* for us than simply heeding the timeout parameter, but we think it will be worth it. For your remote control work, which sounds very cool, I suggest you either (1) enhance notify-send (or find someone to do it) so that you, and anyone else, can set replaces_id, (2) use a scripting language that lets you set replaces_id instead of using a shell script, or (3) if you really want a challenge, work out how to integrate the remote control volume changes into gnome-settings-daemon so that it generates the standard volume bubbles instead of notification bubbles. Marco Chiappero, it is true that expire_timeout is not part of the Hints table and therefore not explicitly optional, though I could get all RFC-2119 about it and point out that the definition of expire_timeout uses the word "should" rather than "must". We are fortunate that the Desktop Notifications Specification was flexible enough to allow what we wanted for notifications in Ubuntu, so we didn't need to fork it. movaxes, showing synchronous things like which workspace you've just switched to would be a misuse of notifications, which are for asynchronous things. But provided you follow the software license, you're welcome to adapt the Notify OSD code for your own synchronous overlays. Justin Clift, if your application is distributed in an official Ubuntu archive or a PPA, you can expect unfavorable ratings and reviews in future if installing it produces ugly notifications not just in your application but in every other application too. And regardless of how the package is distributed, the Ubuntu Software Center will issue a warning if installing it involves uninstalling anything else (such as notify-osd). If you are more specific about what you want, designers could help you find a more harmonious solution; I suggest mailing the Ayatana mailing list <https://launchpad.net/~ayatana> with details. I totally agree with Adrian. Configurable timeouts should be implemented in notify-osd. As long as "-t" option is present in notify-send (and it should be), the ball is in userland. It's sad to see it not being part of the specification. I don't want to add anything more. I'd be waiting for Adrian's fixes. I'm really really really disappointed. These are really good reasons, while still waiting for reasoning from you (I'm ignoring the nonsense above, "consistent" means absolutely nothing here) about this bug (yes, it's a regression). Honestly, who cares about what you think it's best, people do care about properly working and useful software. People want good defaults, not stupid behaviours. That's indeed your job, not preventing people from doing fine their own job. I think I will revert to debian testing, much more recent software and no blind developers. Sorry for the hateful message, but I think you really deserve it. framework for notifications. It's just that you went only one step too far. have consistently failed to prove otherwise. > I'm really really really disappointed. > your job, not preventing people from doing fine their own job. > Sorry for the hateful message, but I think you really deserve it. I forgot to mention. The patch works with version 0.9.24 of notify-osd. Please let me know if the patch works fine. Tested the patch - works great here! > I forgot to mention. The patch works with version 0.9.24 of notify-osd. > Please let me know if the patch works fine. Well let's approach this logically, scientifically, sensibly, and reasonably. We have an easy opportunity to add a "choice", to have the option or not. But we are choosing not to have a choice. The whole point of Ubuntu and free software is to be better than commercial, to actually have the best and brightest minds contribute, not highschool hackers who just want to make a buck and write buggy code. We should somehow at the very least, come half way and allow a choice for to have the expire option or not. Just because no one else does it does not mean we should not have that option (note I am not saying that we absolutely must have it, but a choice). We can choose to use Linux, Windows, or Mac, or something else entirely, we can and should have a choice to enable such a timeout/expire in our OSD displays. Note that I said choice to enable or disable on the server side, not explicitly accepting expire arguments on the client side. With regards to the "silent majority", we don't know how many people have come across this bug, we don't know how many people want it or do not want it. But we have many comments from people who have spent many hours trying to figure out why the expire timeout was not being detected so I think placing a warning about the expire timeout not being accepted is reasonable. Throughout history, having fewer choices has always, eventually, led to monopolies, dictators, and single source dominations. I don't think we are close to that with NotifyOSD, but we are going in that direction if we explicitly deny such a choice. The documentation patch is wrong. Notification is a client/server infrastructure, and it is up to the server to respect or ignore certain client requests (such as timeout settings, amonst others). The man page of the client cannot possibly know which server the user is using. Thus, "currently ignored" is wrong. All you can say is that some servers may ignore certain settings. Vanessa, since you ask, those are four more examples of illogical reasoning. The first is a straw man: "no we won't do that and we won't tell you about it". Nobody has suggested that. Everyone agrees that the man page does not match reality. As unknown and Holger have pointed out, notify-send can't be *sure* that the the server will ignore the timeout -- mate-notification-daemon implements it, at least -- but both Notify OSD and Gnome Shell do ignore it, so it is ignored for most users. That is a bug, but it is not a bug in Notify OSD, it is a bug in the man page. It's roughly the equivalent of a Web reference describing HTML's <blink> element without mentioning that the browsers used by most people now ignore it. The second is assuming the question: "we have proven it with this thread alone". As I said earlier, the cases described in this report are cases for which *any* asynchronous notification system wouldn't work reliably -- whether they had developer-configurable timeouts or not. The notification your app triggered might be queued behind a dozen from other apps, and therefore not appear until a full minute after you wanted it to. The third is an invalid premise: "Linux is community based, anyone can contribute, the features that people want get in." Features people want are often rejected from Linux. For example, there is no user-switchable option to choose BFS or any other process scheduler, because to quote Linus Torvalds, such an option would be "really bad for users in that it forces the user to make some particular choice that the user is usually not even aware of". The same is true for most other components of Ubuntu, including the notification server; their designers often say no to things. But just as with the kernel, you are welcome to install or compile your own. And the fourth is a sunk cost fallacy: "We've wasted so many days and weeks on this topic, it needs to be addressed". The word count in this bug report is not evidence of anything except people's awe-inspiring willingness to post comments instead of fixing a man page. Finally, since you asked, Ubuntu 12.04 experiences a crash or similar error, on average, once every 25 days, 13.10 once every 14 days, and Trusty currently once every 11 days. The equivalent figures for Windows are not public. The people trying to figure out why notifications linger at the top of the screen for way too long and cause new notifications to come in late and pile up in a chain that can go on for several minutes are not reading outdated documentation; they are trying to figure out what is wrong with this implementation. 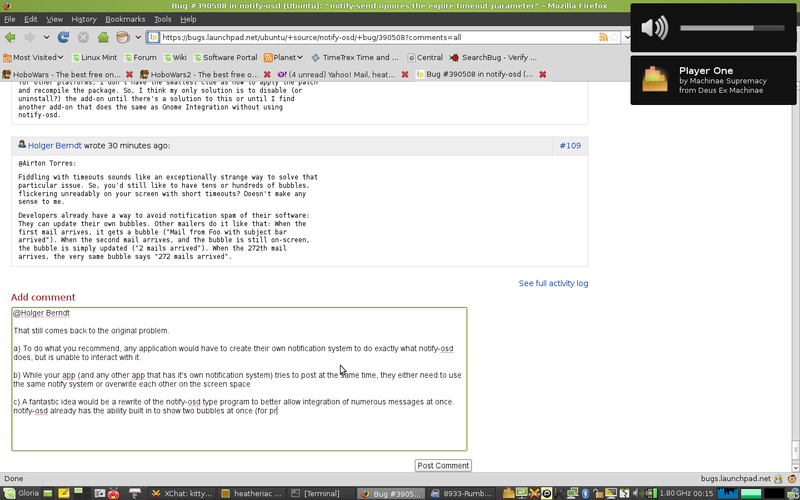 Besides, the documentation contradicting Ubuntu's implementation at freedesktop.org isn't outdated. That is another example of assuming the question. Following the standards process I described in 2014-01-02, the next step would be for the spec to be updated, reflecting the fact that the implementations used by most people eschew that property. Fact remains that, for as long as the spec continues to say otherwise, notify-osd and Gnome Shell are in violation of the spec. * Remove the parameters from your API. Take it out of the function signature, take it out of the command line tool. Stop fooling programmers and users into using silently ignored parameters, that's just bad coding! * Document this (in the API docs, in the man page) and own up to the fact it's a spec violation. It's in your best interest to tell people what's going on, so you don't get more bugs like this opened. Then you can close this bug as "fixed" – or "wontfix", depending on your outlook on the issue. Updating the spec is a completely different discussion. Maybe it should be done, maybe not; deal with your mess here first. there's also the fact that lacking support for the timeout parameter allows for notifications that do not reliably disappear, ever. That's unlikely to be related. If you have a reproducible example of a notification bubble that never disappears, please report it as a separate bug. Thanks! I was developing a script based on inotify that would use very short-lived onscreen notifications. Turns out I can't, at least not with notify-send; I spent some time trying to debug my script before thinking it might be a bug elsewhere. The bug isn't in notify-send; this is part of libnotify which properly implements the timeout specification (you can send the timeout parameter). The problem is in notify-osd (Canonical's notification front-end) which does not properly implement the timeout specification (it will not receive the timeout parameter) for no justifiable reason as I have pointed out with quotations from Canonical's notification specs, the freedesktop specs, and specific real-world use cases. Let me at this time express my appreciation for pantheon-notify, a notification front-end from that does everything right. The notifications do honor the timeout parameter and feature a close button as well for when you want them to just go away. It does nothing less than notify-osd can do and everything more. 5 years later, another random person on the internet spends hours trying to figure out why the documented -t switch won't work, eventually taking him here only to find out that the man page is documenting a feature that won't work. Count Notify-OSD: [admiring his torture contraption] Beautiful isn't it? It took me half a lifetime to invent it. I'm sure you've discovered my deep and abiding interest in pain. Presently I'm writing the definitive work on the subject, so I want you to be totally honest with me on how the machine makes you feel. This being our first try, I'll use the lowest setting. Count Notify-OSD: [calmly] As you know, the concept of the suction pump is centuries old. Really that's all this is except that instead of sucking water, I'm sucking life. I've just sucked one year of your life away. I might one day go as high as five, but I really don't know what that would do to you. So, let's just start with what we have. What did this do to you? Tell me. And remember, this is for posterity so be honest. How do you feel? Since everybody else over the past five and a half years has been more willing to make epic bug comments decrying the ridiculousness of this bug than to actually fix the man page, I have just submitted a fix for the man page (bug 533631). It was a two-line change. It would be great if they would accept that, but this is an issue they "won't fix". If they did accept your manual page fix, someone down the line would say, "hey, wouldn't it be great if we could add a timeout option?" Then the cycle of madness repeats (with a longer circumferance). It's pretty clear that the majority opinion is to have this fixed by IMPLEMENTING the timeout parameter, not sweeping it under the rug. The #1 reason people end up here is looking for some way to make Notify-OSD's notifications go away faster. (less than 1000 milliseconds and it appears to use 2000 milliseconds). -t despite the intransigence of the Ubuntu developers on this tracker. Matthew Paul Thomas (mpt) we don't know how many people are annoyed with this bug vs those who are not because today, we simply don't have as many competent programmers as we did a decade ago (before the tech industry boom) that will delve this deep into a problem amoung the programming community. Obviously with this many comments and complaints alone we could say that this is an issue that isn't going away. I've read the comments defending the position that the -t parameter should be ignored. I still don't understand. I'm dumbfounded. I can honestly see no harm whatsoever in adding support for it. There are plenty of use cases for which the default time out does not work well at all. The current implementation violates the spec. Why are you so stubborn? I don't quite understand either, and I try to be as inclusive as possible in life, but my complaint is that there is an "official" stance to ignore the requests for a warning on the "official" documentation that says something works that does not. That is inhernetly saying, "yes I officially said A works, but I also officially decided that I will not have A work and also not mention that it does not work." this issue seems to scream: "We don't take feedback"
Vanessa, I added that warning to the official documentation two months ago (bug 533631): "Ubuntu's Notify OSD, and GNOME Shell, both ignore this parameter." I agree with quequotion, you can't assume that the number of people annoyed by these issues are limited to the number of people complaining about it in a bug report. Case in point, I ditched Ubuntu entirely on my desktop because systemd rendered it unbootable. I'm not going to file a bug report, I'm just going to leave, because systemd is a (poor) design decision they're apparently going to stick with no matter what... just like this notify-OSD timeout nonsense. Also: happy 6th birthday, notifyOSD bug! It's comforting to know that some things will never change. Since queqotion and Kent both misunderstood the same word: "Disproportionately" does not mean "the complete set of". It means "biased towards". Just because I don't agree with you doesn't mean I don't understand your lexicon. I just think you're wrong. The group disproportionately represented on launchpad is not who you think it is. However, it's the people *not* represented on launchpad that you're *even more* wrong about. The design decision to remove support for the options are undermining the effort by developers who put it there and the whole (IMHO correct) thought process behind their work. The incorrect design decision is taking away my *freedom* to use these options as i see fit. Do you really want to take away my freedom? Is this what ubuntu is all about? I guess “Did I miss something?” was a rhetorical question, since Nicholas did not subscribe to receive any answer. But he missed three things. First, as I wrote on 2015-02-06, I fixed the man page myself (bug 533631). Trivial bug fixes are seldom backported. Second, I did not cite the possibility of using other software to “justify [the] design decision”, merely to disprove the ludicrous claim of “taking away my freedom”. And third, as I wrote on 2009-10-02, a global configuration option would not involve the timeout parameter at all. Adding one is part of bug 420583. Glad to see this bug is still bothering you, because it still bothers us. bug 420583's proposal great, and it's been sitting there for seven years. Seven years ago there was an idea that could probably have avoided all this trouble. Did the x time per n characters algorithm ever really get implemented? Where is the proposed settings dialog (aside from leolik's fork, which has one)? How much progress has been made toward making the hooks customizable? Displaying first 40 and last 40 comments. View all 272 comments or add a comment.